Welcome to Pima Junior High School; the best school in the Gila Valley. I am very excited to be serving as the new principal with the best staff and students around. Our goal is to become an “A” school by providing our students with the tools and knowledge they need to succeed in high school and beyond. We have been working very hard to make the 2018-2019 school year the best ever for our students and community. There are some exciting new changes this year at PJHS. We are hopeful that these changes will provide outstanding opportunities for all of our students to grow and have positive learning outcomes. There is a rich tradition at Pima, and we all have a responsibility to carry on these traditions of family, expectation, and achievement. Our class schedule has changed and expanded to nine class periods daily. This will allow us to better serve our growing enrollment and keep our class numbers at a size that will promote higher academic achievement. We have also added a computers course and a full time physical education curriculum to our offerings this year. Rotation courses in woodworking, welding, Spanish, and music are available to eighth graders this year. We will offer art, health, communications, and drama as rotation courses for seventh grade students. Let’s make this school year the best! Mr. Ryan Conrad, M.S., M.Ed. We are proud of our talented and caring staff at Pima Unified School District. As parent/teacher communication is essential to your child's success, we invite you to contact your child's teacher by email. Please pay all junior high sports fees at the district office. Parents, please be aware that PUSD is now implementing an electronic form of communication with the parents called Power Announcement. We will send an electronic message via cell phone (text), voice message, and/or email. In some cases, all of the above. If you would like to know more about Power Announcement, please contact Cody Marshall at 387.8101. Examples of a Power Announcement include if your child is ineligible, if your child owes lunch money, if your child has excessive absences, or if the school wants to specifically remind a grade level of an upcoming event. A child should be fever-free for 24 hours (without fever reducing medicine) before returning to school. Keeping a sick child home helps prevent the spread of disease at school. Please help keep our school healthy. If your child must use medication while at school, the parent/guardian must check in with the school nurse and complete the proper paperwork. All medications need to be in the original container. If it is a doctor prescribed medication, the prescription label must be present. If you have a student who has been prescribed an inhaler for asthma purposes or epi-pen for allergies, the school nurse must have written documentation from the parent/guardian giving permission for the student to carry these types of medications with them. These are the only medications students are allowed to carry. The Arizona Department of Education has released the Arizona LEARNS achievement profile for the 2010-2011 school year. Learn more about our profile and our Arizona School Improvement Plan. 1st Period - 7:45–8:30 a.m.
2nd Period - 8:35–9:20 a.m.
3rd Period - 9:25–10:10 a.m.
4th Period - 10:15–11:00 a.m.
5th Period - 11:05–11:50 a.m. Lunch - 11:50 a.m–12:20 p.m.
6th Period - 12:25–1:09 p.m.
7th Period - 1:14–1:58 p.m.
8th Period - 2:03–2:47 p.m.
9th Period - 2:52–3:36 p.m.
1st Period - 7:45–8:20 a.m.
2nd Period - 8:25–9:00 a.m.
3rd Period - 9:05–9:40 a.m.
4th Period - 9:45–10:20 a.m.
5th Period - 10:25–11:00 a.m.
6th Period - 11:05–11:40 a.m.
7th Period - 11:45 a.m.–12:22 p.m. Please visit our Athletics page for the latest sports schedules and updates. Be sure to check out our Volunteer page for more information about what you can do to help out. We appreciate any amount of time that you can give! 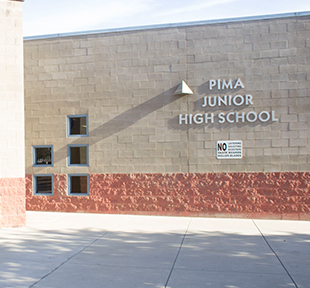 The mission of Pima Junior/Senior High School is to provide every student with the academic, problem solving, and social skills that will enable them to be responsible citizens ready to conquer tomorrow's challenges.